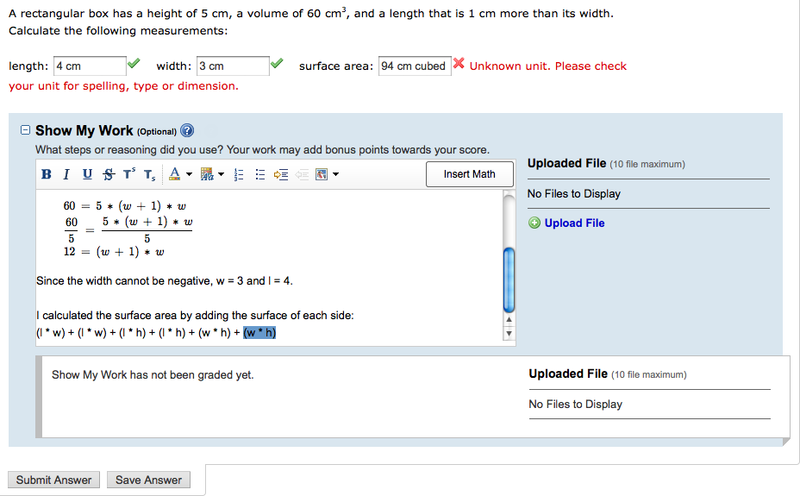 You can enable Show My Work to let your students explain the reasoning behind their answers on assignment questions. When you enable Show My Work for a question, your students can enter formatted text and math expressions in the Show My Work answer box. They can also upload files, such as digital images of a whiteboard or paper sketch, a word-processing document, or a graphic created with a drawing application. Note Your students can submit Show My Work question parts as many times as they want before the assignment due date, regardless of the number of submissions set for the assignment. You or your teaching assistant can then review each of your students' Show My Work responses and add comments or change the question-part scores based on the completeness or correctness of the work shown. You can award points for optional Show My Work responses, for example, if a student demonstrates understanding of the problem but makes a mathematical error. You can set Show My Work as Required, Optional, or Disabled. Your students see the expanded Show My Work box at the end of the question. You set the value of the Show My Work question part. Your students must complete Show My Work question parts to receive full credit. Your students automatically receive full credit for any Show My Work response. Your students see the collapsed Show My Work box at the end of the question. The Show My Work question part is worth zero points. Your students do not need to complete Show My Work question parts to receive full credit. Your students can complete Show My Work if they want to, but they do not automatically earn any points. Your students cannot show their work. You can configure Show My Work in your assignment or assignment template settings, for example, to require Show My Work for all questions. You can configure Show My Work for specific questions on an assignment, for example, to enable Show My Work only for a few questions.